Re cars vs. cabs vs. public transportation in Memphis. Many of the city's attractions are downtown and easy to reach on foot. There is a free shuttle service that leaves from the Rock and Soul Museum downtown that will go to Graceland and Sun Studio - it's very easy and convenient. Most other attractions are reachable via bus (the central terminal is a little bit north of downtown, at the northern terminus of the Main Street trolley line). The bus system is mainly used by poor folks and not commuters and is usually (if not always) reasonably reliable, so if that's a problem for you, a rental car or cab is probably a better choice. I didn't mind the bus, myself. A cab or car is necessary if you want to visit the National Ornamental Museum or the Slavehaven-Burkle Estate, and given that the area around the STAX Museum is not good, you may feel more comfortable using a cab or car going here as well. You'll usually find cabs right by the "happening" part of Beale Street where all the clubs and such are. If memory serves, they're usually around 3rd Street and Beale. 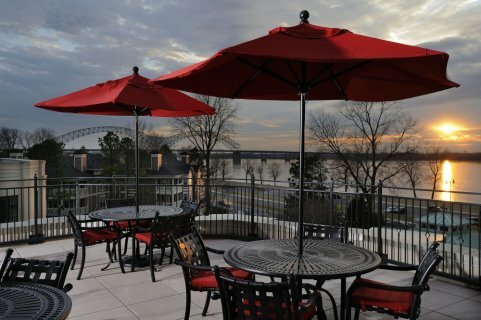 The Peabody Hotel is centrally located and the surrounding area is fine. Plus, the Peabody Ducks will be right in your lobby downstairs, and seeing them do their grand entrance or exit via duck wrangler is delightful fun. The River Inn is a long way from Downtown on Mud Island - there's likely no public transportation nearby, and walking between the two areas will probably pose significant safety issues, especially after dark. Unless you rent a car, I wouldn't consider the latter lodging option.